"Call for Aritsts: Take Part in an Art Research Project"
Artists are cordially invited to take part in a research conducted by MIT - Massachusetts Institute of Technology and ArtForecast. The research examines the myth of the term �Eye for Art� by presenting a set of artworks images to various participants. Participants are challenged to choose the most promising artwork out of a given set and to try to predict which artwork will be the most valuable in one year. Please enter www.ArtForecast.org for more information and to take part in the research. 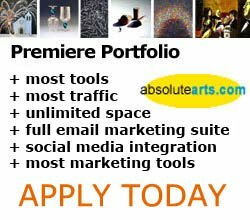 Artists are invited to submit their artwork for possible inclusion in ArtForecast.org (subject to approval of the committee) and benefit from the exposure.